The app was designed to be used by ASA instructors while teaching the ASA 101 course. 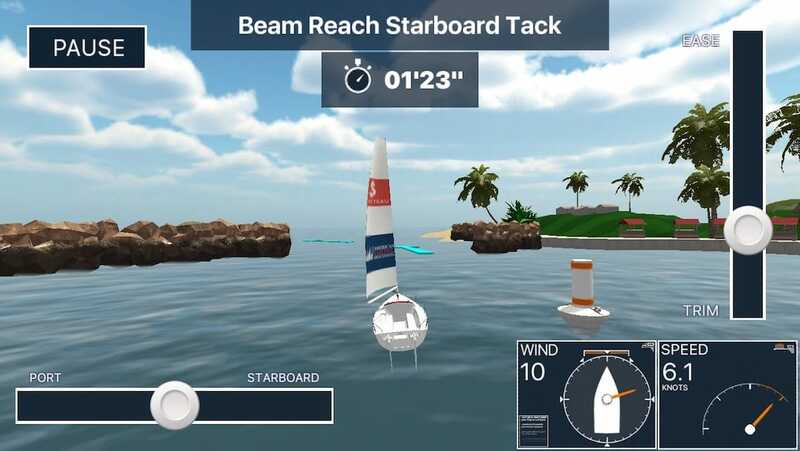 The app teaches the basic sailing concepts using techniques that accelerate learning and embed the information subliminally. 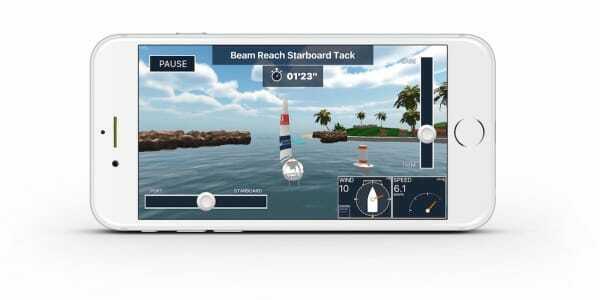 The app makes teaching the concepts of the Points of Sail, Trimming and Tacking and Jibing easier to teach and easier to understand by using the app’s virtual world. Before and after the lesson the app helps new sailors retain information. By releasing this app ASA has jumped to the forefront of today’s cutting edge educational technology. The same way people remember the words to a thousand songs they like, your students will retain the difference between a Broad Reach and a Beam Reach on a subliminal level, making your job easier. Here is how we suggest the app be used during the 101 Sailing Made Easy course. When students register for classes, recommend that they become familiar with the Points of Sail and the Trimming modules of the Sailing Challenge app, and you will experience the app’s ability to make your lessons smoother and faster. We are very interested in your feedback and in improving and expanding our digital teaching aids. Before a student’s first on-the-water lesson. One of the first things your students need to understand en-route to becoming sailors are the points of sail. 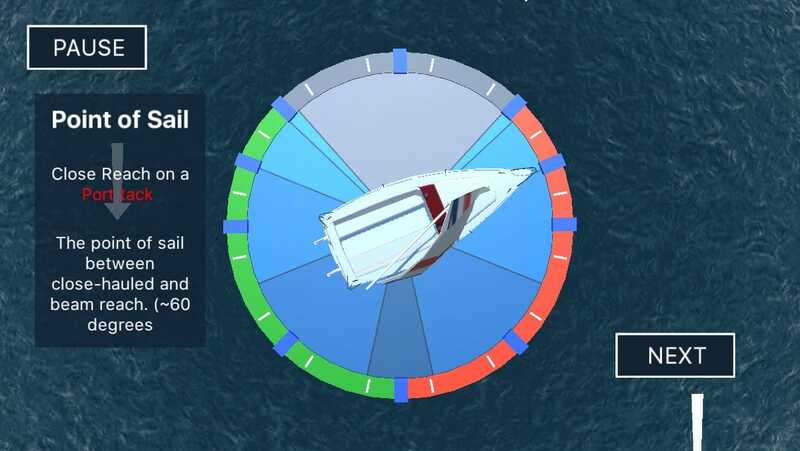 The Points of Sail Module teaches the points of sail first, and then tests their knowledge with a fun game. If you think you’re already a master, and we are sure you are, try the Challenge Mode and find out how good you really are! 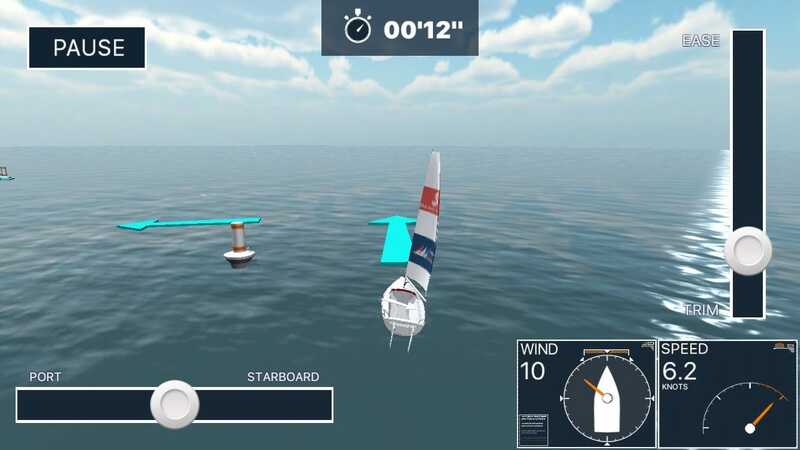 Use the Sailing Challenge game to help your students prepare for their first lesson on the water. Ask them to play the Points of Sail module before they come for their first lesson. The module was designed so you can spend more time on the water teaching. If you start by pre-assigning your students to play this module they will be better prepared. The Trimming module allows students to trim the main and see its positioning and effect before they get on a boat. They’ll learn how the main’s angle affects the speed of the boat depending on which direction they would like to travel and on what Point of Sail that direction is. The game will help your students understand that every time the boat’s Point of Sail changes the sail trim must change as well. In the Trimming module players learn how to trim the sail for maximum efficiency. You’ll be able to spend more of your time teaching things that you can only teach on the water. By playing the Trimming module and the Points of Sail module before coming to their first class your students will be much better prepared. After a student’s first on-the-water lesson. This Apparent Wind module shows the combination of true wind and the wind’s effect of motion as felt aboard a moving sailboat. Players are able to turn the boat onto different points of sail, as well as adjust the speed of the wind, in order to see the changes in apparent wind. 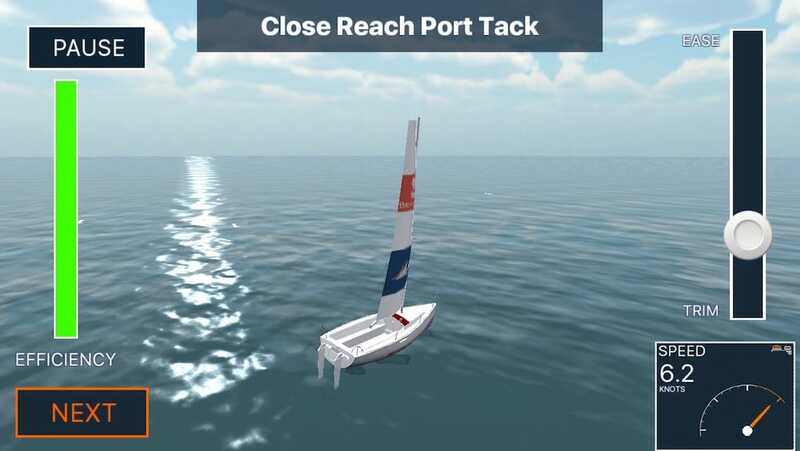 The Tacking and Jibing module helps students understand the concept of reaching a destination most proficiently directly upwind or downwind of their position. This module teaches players how to tack back and forth in order to achieve that goal. Although, players can sail on any point of sail, directional arrows used as guides on the water show them the way. 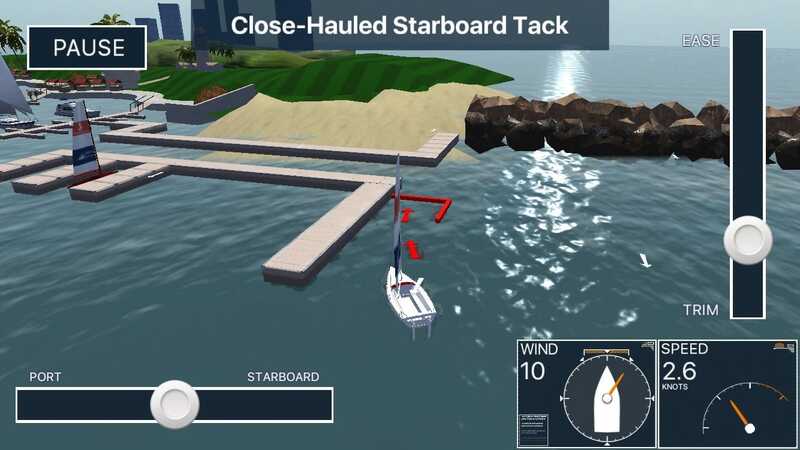 By timing the sail upwind the game module easily illustrates the consequences of going to weather in a Close Hauled course compared to a Close Reaching course. The second half of the module deals with reaching a downwind destination by jibing. Once again there are directional arrows used as guides on the water. However, students may also sail on any point of sail to reach their downwind destination and see the effect a proper course can make. After a student’s second on-the-water lesson. Approaching a dock under sail can be one of the most intimidating parts of learning to sail. 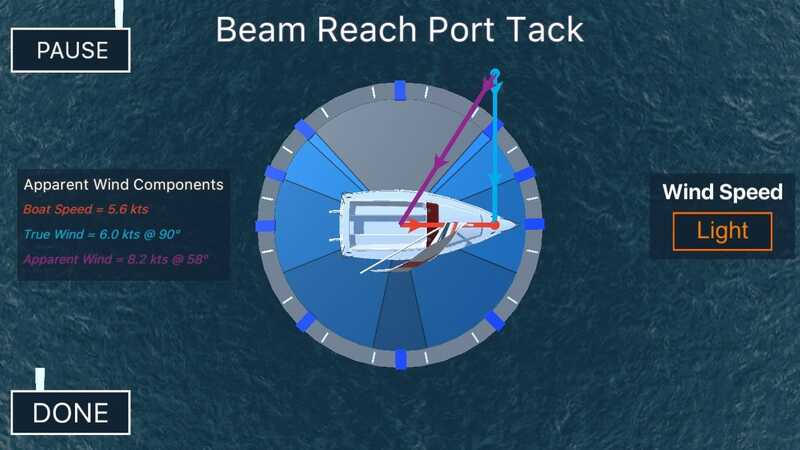 In this module, players can experience different docking scenarios and understand the principles involved so they can dock perfectly every time! After a student’s third on-the-water lesson. By this stage students will be ready to use everything they have learned to take on the two courses in the Sailing module. The first course is the Marina Tour – They will trim the sails, cross the starting line, find the inlet, tack in to the harbor, take a quick look around and sail back out and go for the finish line. They can record their time and send it to ASA. Once they have mastered the Marina Tour it’s time for the Islands Tour. It’s about twice as long and, like the Marina Tour, uses every point of sail and familiarizes students with the concept and fun of day sailing. 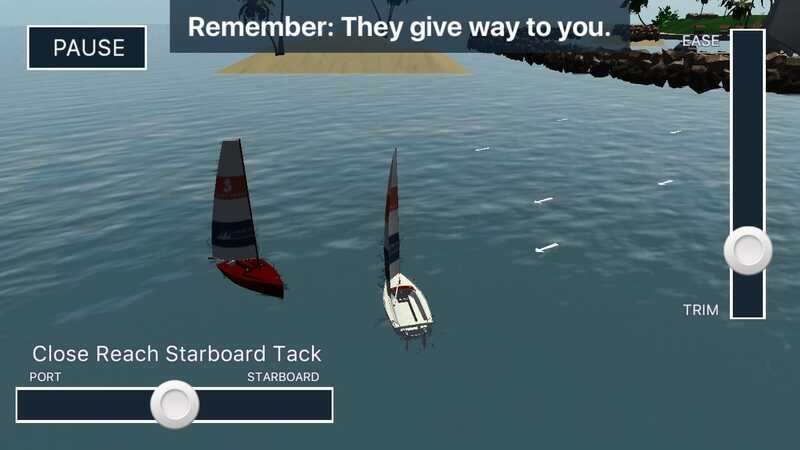 Just like sailing for real, the game needs practice, but it will help your students become better sailors and make it easier for you to transfer your knowledge of how to sail!